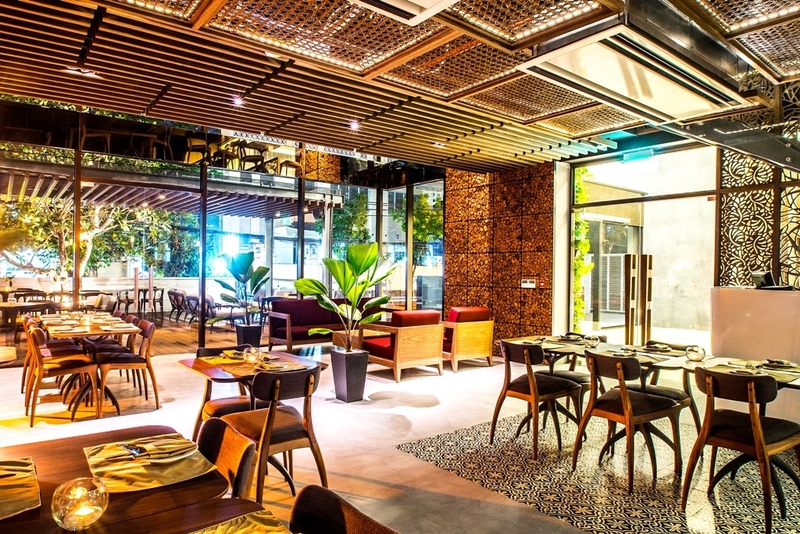 If you’ve been in this town long enough to remember the original Qing wine bar on Dong Du – back in 2004, it was the first of its kind in Saigon – you’ll be pleased to note that some of its groundbreaking Asian tapas have been resurrected at twenty21one (21 Ngo Thoi Nhiem, D3), a new casual-contemporary dining venue that has opened within the Sila Urban Living hotel/apartment complex in District 3 last month. The “fifth-and-a-half ” restaurant under the management of Tony Fox—best-known here for his intimate Italian venues Ciao Bella and Portofino, and Mediterranean bistro Saffron—this new one is a marked departure from the others both visually and conceptually. Come to share—the menu is optimized for picking and grazing from a selection of small-plate meals in bite-sized portions. 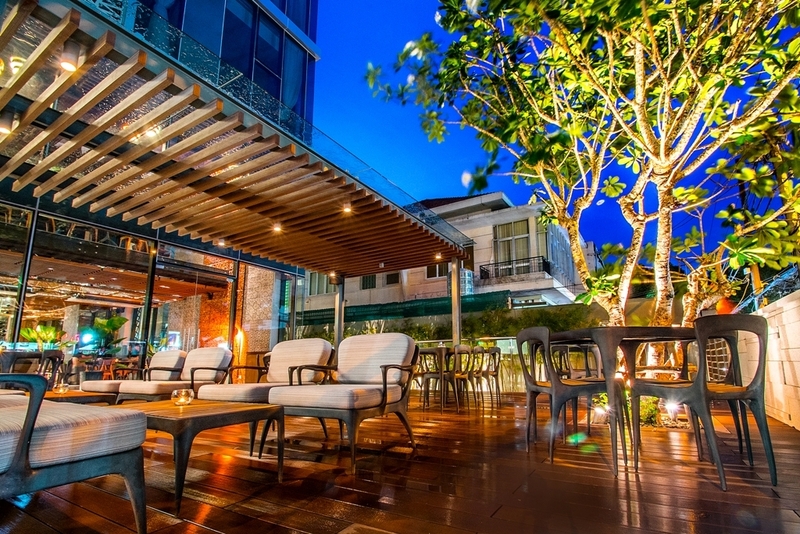 In look, twenty21one has a spacious fine dining area that manages an edgy modern energy. It’s all decked out in handmade tiles and natural wooden furnishings with heavy designer steel fixtures—you won’t get far if you try to steal the tables, they weigh a ton. There are two dining levels: an upstairs mezzanine is already being used as a networking/private dinner space; connecting through to the hotel, it will soon be a venue for choice buffet breakfasts as occupancy picks up. Downstairs are several distinct clusters of tables with both private and exposed positioning; open-air streetside; and a terrace by the pool out back. 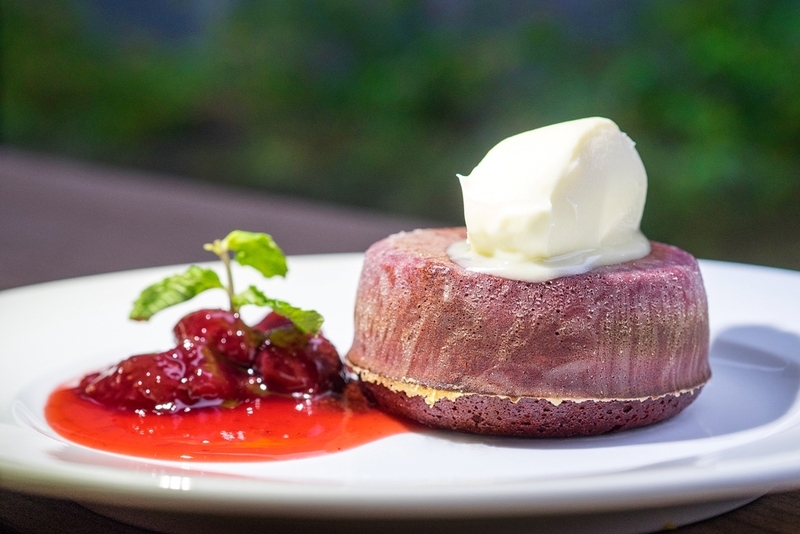 Instead of the continental European staples you’ll find at Tony’s other bistros, the fare springs back and forth between fusion and non-fusion elements, with the menu roughly divided into two broad categories: Looking East, and Looking West. As a new venue, the cuisine lineup is still evolving, but you’ll be reading it on a tablet—so you can be sure that whatever you’re looking at is current and includes the daily specials. Rather than serving heavy mains, most items come as a tapas set. 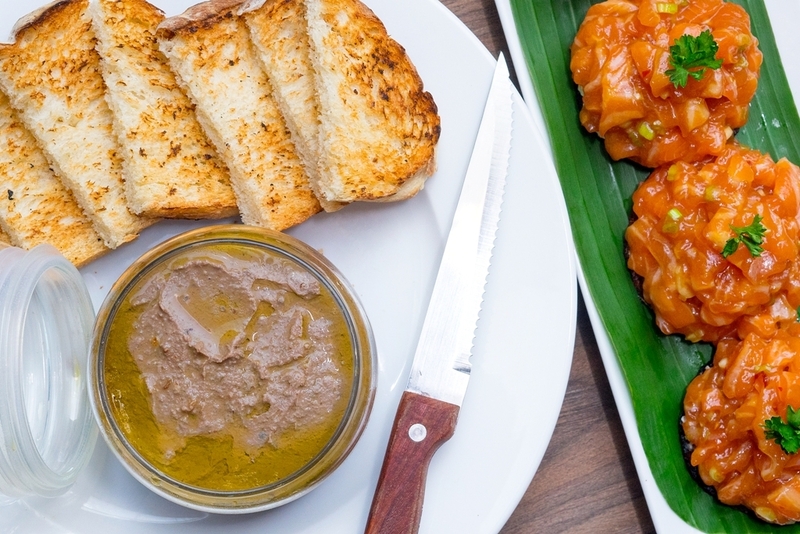 You’re pushed in two directions from the first complimentary nibbles—expect a plate of traditional crispy Vietnamese sesame crackers with a fresh tomato salsa at lunch time, or bread with a miso roast garlic butter in the evenings. We sampled two dishes from each compass point and discovered a serious overlapping of cuisines that constitute some of the most thorough fusion offerings you’ll find in the city—most of which are Tony’s own concepts. Our Crispy shredded duck spring rolls (VND150,00) were an obvious game played with local cha gio and Peking Duck. 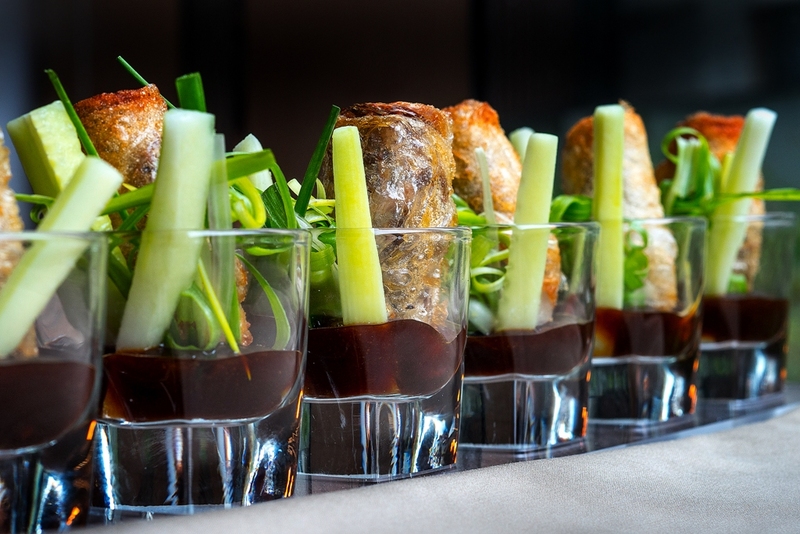 Fans of the latter are in for a surprise—all the elements are there; the sweet hoisin sauce, the cucumber and spring onion—but these are employed to replace the fish sauce dip and side salads for deep-fried Vietnamese spring rolls, stuffed with duck rather than minced pork. A taster spanning both sides of the Friendship Pass, the dish is teasingly served in a line of shot glasses. Equally intriguing is a number that’s been a bestseller for Tony ever since Qing days—the Korean spiced salmon (VND195,000) served on “kimchee blinis” with wasabi cream cheese. 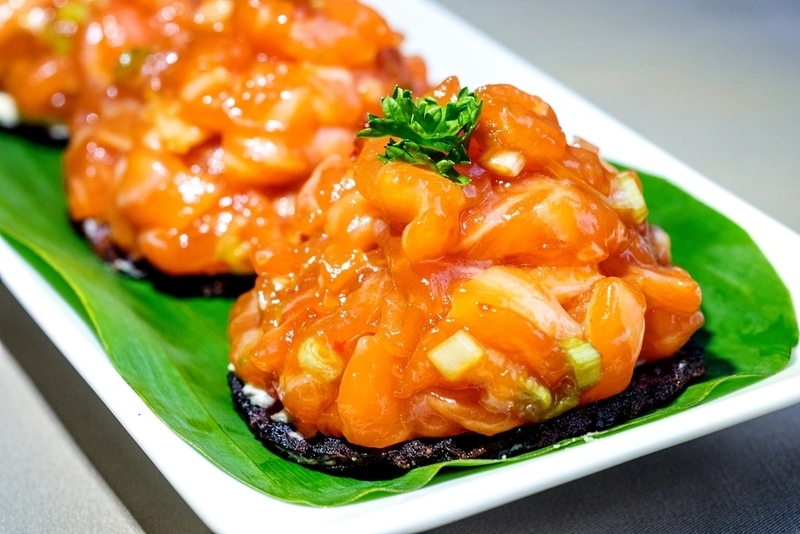 Decide for yourself whether it’s a take on an American smoked salmon bagel or a hunk of Japanese sushi—with the very-mildly-spicy heap of diced sashimi lying on the almost mustardy blended cheese base and Russian-style pancake like a soft cream cracker, you have one of the most international dishes served anywhere. Don’t share these, eat them all yourself. 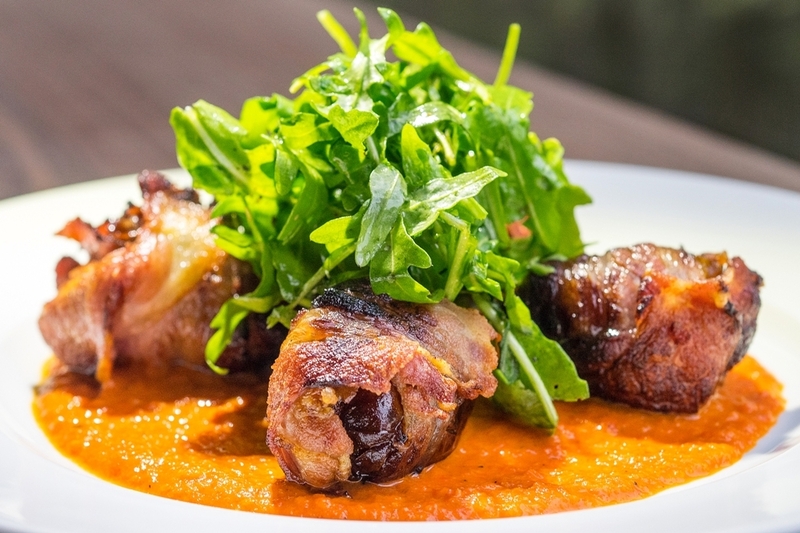 Another firm favorite for pizza fans looking for a new angle are the Bacon-wrapped dates (VND170,000), stuffed with a pungent Roquefort blue cheese and laid on a roast red pepper sauce base. Pop one in your mouth and you’re in familiar territory; chew through to the date and you’re all over the map. The filling has a sweet bite that nicely offsets the salty bacon shell. One of the more unusual selections on the menu is the Duck in a jar (VND170,000) that is essentially a glass pâté pot served with toast points for spreading or dipping. The contents of the jar are actually a cross between a mousse and a foie gras mashed with port wine to give it a soft, almost tangy aftertaste. With a gentle sweetness running through our entire selection, this meal was nicely paired with a syrupy Lychee martini (VND125,000), its vodka rigorously absorbed into the lychee juice, making it a refreshing, easy hit. Folks have been known to head to Ciao Bella for its desserts alone; the same sweettooths will be led to twenty21one for delights such as the Warm molten red velvet cake (VND135,000) with its strawberry compote and creamy mascarpone, somewhat reminiscent of a baked Alaska with its crisp sponge-cake shell and eruption of crimson lava with the dip of a spoon. Ciao Bella’s pope’s pillow meringue will have to stand aside for this rather more devilish upstart. Tony himself, whose restaurant management flair is based on over a decade’s worth of experience in LA and New York, is already entertaining significant lunch crowds at twenty21one—and although the restaurant is ever-so-slightly out of the way in terms of location, he does anticipate that evening crowds will be increasingly drawn in by the venue’s cool ambiance at night, with its candles, low lighting, and Café del Mar soundtrack. Let this venue slowly seduce you, and you may just find yourself telling your social networks that you’re feeling like 21 again.